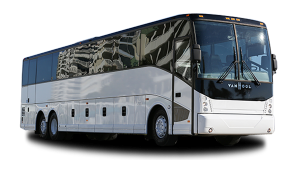 Travel across long distances in complete comfort with a spacious 56-passenger charter bus. Outfitted with premium amenities and designed for complete comfort, this bus is perfect for large traveling groups who plan to be on the road for at least a few hours. Enjoy reclining seats, entertainment options, an on-board restroom, air conditioning, and more for maximum comfort on the road. Total Charters makes it easy to enjoy road trips by providing personalized bus accommodations and an easy, stress-free booking experience. Rely on us for all of your travel across the Midwest, from St. Louis to Louisville to Chicago, Detroit, Indianapolis, and beyond. We provide transportation services to groups of all types. Whether you need a shuttle service at your wedding, a comfortable coach for a field trip or church event, or help with an emergency evacuation, we’ll find the perfect model for you. Call our reservation specialists today at 1-866-303-2594 to reserve your bus!